For a comedy with action overtones, we move to 1979’s The In-Laws. Sheldon "Shelly" Kornpett’s (Alan Arkin) daughter Barbara (Penny Peyser) intends to marry Vince Ricardo’s (Peter Falk) son Tommy (Michael Lembeck). Despite the impending nuptials, the soon-to-be in-laws have never met, a situation that changes over an introductory dinner. Shelly finds Vince to display odd behaviors, a situation that intensifies when Ricardo claims to work for the CIA. Eventually the two go on nutty adventures as Vince draws Shelly into his world. I didn’t see In-Laws back in 1979, though I don’t know why. No, it didn’t seem like something that would appeal to a 12-year-old, but I saw plenty of other more “adult” movies, so I don’t know why I missed it. Given its superior reputation, I entered the 1979 film with higher expectations. Happily, it largely lived up to those hopes and provided an amusing experience. Not that anyone will embrace In-Laws as a study in realism. To enjoy the movie, one must suspend disbelief from start to finish, as the preposterous story throws out multiple leaps of logic and credulity. In-Laws compensates for its absurdity with a witty, clever script. Does any of it make sense? Not really, but the screenplay milks its wacky situations for so much humor that I don’t mind. Some of the best laughs come from the film’s small moments. I love the bizarre rant Vince goes on about “tse-tse flies the size of eagles” that carry off babies in the jungle, and any film that originated the “serpentine” maneuver works for me. A talented cast helps sell the material, with great chemistry between Arkin and Falk. Arkin plays the straight man role perfectly, and Falk becomes a delight as the oddball agent. The supporting cast fare well, too. James Hong throws in a great turn as a Chinese flight attendant – replete with frilly scarf – and Richard Libertini’s Senor Wences-leaning Latin American dictator brings a fine sense of wackiness to the proceedings. In-Laws delivers consistent laughs. It’s completely unbelievable and completely delightful. The In-Laws appears in an aspect ratio of approximately 1.85:1 on this Blu-ray Disc. Given its origins, Lot provided a largely good image. Sharpness generally seemed solid. Some minor softness interfered at times, but those moments appeared infrequent. As a whole, the program looked nicely delineated and well defined. Colors came across as reasonably bright and accurate. The movie went with a natural palette, and the tones seemed solid and vibrant. Black levels usually stayed nicely deep and dense, while shadow detail showed positive consistency. Ultimately, In-Laws offered a positive image that held up well after almost 40 years. As for the LPCM monaural soundtrack of In-Laws, it was perfectly acceptable for its era but no better than that. Speech sounded intelligible and clear, though the lines tended to appear a little stiff. The movie offered a perky score, and these elements came across reasonably well. While the music lacked great range, it seemed clear enough. As we head to extras, we start with an audio commentary from director Arthur Hiller, writer Andrew Bergman and actors Alan Arkin and Peter Falk. Recorded for an old DVD, all four sit together for this running, screen-specific look at the project’s origins and development, cast and performances, sets and locations, and related topics. The commentary starts well, as we learn about the movie’s roots in a lively, informative way. After that, unfortunately, the discussion loses a lot of steam. This means we tend to hear general praise and happy talk without a slew of great details. We still learn a bit about the production, but the commentary doesn’t give us a terrific view of the film. Created for the Criterion release, we get an Interview with Alan Arkin. This runs 24 minutes, seven seconds and looks at his career and aspects of In-Laws. Arkin proves to be charming and engaging in this enjoyable conversation. 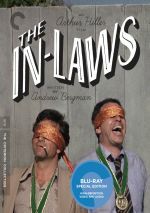 In Support of The In-Laws goes for 34 minutes, seven seconds and includes comments from actors Ed Begley Jr., James Hong, Nancy Dussault and David Paymer. They discuss their roles and the film’s production. This becomes another informative and likable chat. In addition to the film’s trailer, we get a booklet. It includes work from Hiller and comedy writer Stephen Winer. The booklet finishes the set on a positive note. A comedic farce from start to finish, The In-Laws throws logic under the bus – and I don’t care. The movie comes with so many solid laughs that it easily overcomes its inherent ridiculousness. 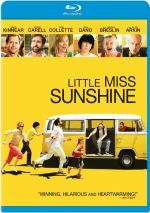 The Blu-ray brings us positive picture and audio as well as a few useful supplements. In-Laws becomes a winner.